It was flipping hot here on New Year’s Eve. Nowt for it but to batten the hatches, shut up the house, switch on the fan and sew. I took the bodice of the 117B dress from Burda magazine 5/2009 (thank you, Yarra Library), cut down the back neckline, and frankensteined a pencil skirt from elsewhere, but stole the darts from the Burda pattern so they’d match the bodice. Cunning. Cunninger still, perhaps the cunningest thing I’ve ever done, I hacked off the back of the skirt and drafted a fishtail. I’ve always, always wanted a fishtail dress. Always. Probably came out of the womb demanding one. But the perfect pattern evaded me and I thought it would be tricksy to do. It certainly isn’t. I may now fishtail every dress I make. The fabric here is part of the Nina Wish collection – a huge haul of fabric I bought when Nina Wish moved out of Melbourne and sold everything she didn’t want to move. Giant yellow dots! Huzzah! The construction was a bit trial and error with lots of basting, trimming, basting, trimming, until it was right. I wore it out dancing for New Years Eve and it was ace. Happy new year, folks! Nearly there… after hours of handstitching the placket and hem… just needs buttons and buttonholes. The spots look so crisp and fresh (and I’m not a very crisp and fresh person, so it does feel like a costume). I just can’t get over my luck finding the classic yellow and grey combo. 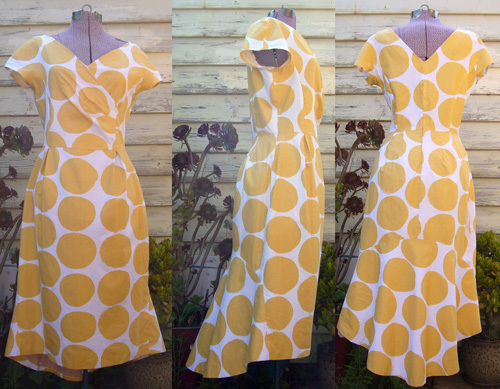 I pulled out every decent yardage I own to see what would be best for the Fifties Fair frock I have to whip up by Thursday. They either weren’t quite right or I couldn’t bring myself to cut them just yet. So, shopping! 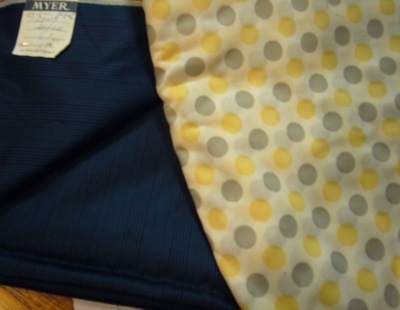 I hit the Brunswick hotspots upon advice from Moggy (who is making her Fifties Fair frock from a particularly tasty splashy cotton sateen) and picked up some voile in possibly the most fifties colour combo in the world: yellow and grey. Nice, eh? The other one is a heavy sateen remnant that may or may not be an accompanying bolero. Let’s see how I go. 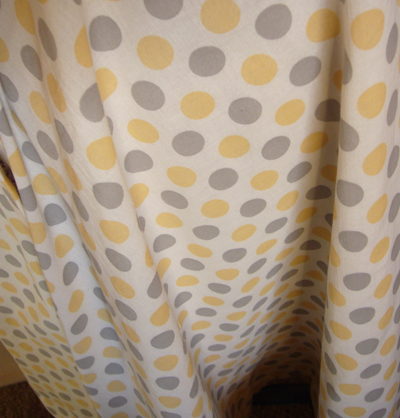 I also got some crisp plain voile to line it but it was too blinding-white. I wanted something just a little bit yellowy-creamy like the background of the dots. So I stuck it in some tea… too pink. Then some instant coffee… more browny than yellowy. Then the Curmudgeon, who proclaims himself uniquely qualified in the craft of staining clothing with foodstuffs, suggested a bit of turmeric. Threw that in too and you know what? Perfect. Plus, I will smell just a leetle beet like curry. 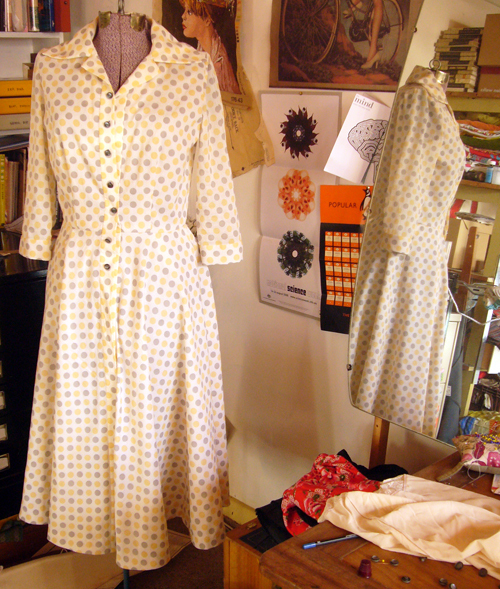 Now, to cut out my circa 1976 Style 1542 pattern and whip it up! And 1950s purists bedamned!